After the Memorial’s unveiling in 1930, time eventually took its toll on the sculpture and the landscape. To avoid frequent flood damage, the stream was routed through a pipe under the pond and drinking water was used to fill it. In the 1980s, the monument and its plantings received a much-needed refurbishment by a joint effort of the Seeders and Weeders Garden Club, Westinghouse Electric Corporation Foundation, the Richard King Mellon Foundation and the City of Pittsburgh. Over the next decades, with reduced resources for maintenance, the Memorial again declined. The monument sustained damage. Lighting was removed. The pond failed when the pipe conveying the stream broke in 2009. In response, the City of Pittsburgh and the Pittsburgh Parks Conservancy agreed to partner in a comprehensive restoration of the Memorial, and in its long-term maintenance. Green infrastructure elements of this project represent an investment in a multi-agency Panther Hollow Watershed Restoration Plan. One priority was to protect the monument from the stream by piping Phipps Run around, rather than under, the pond. During storms, the entire Memorial landscape is protected by two green infrastructure components that reduce rain water runoff from the adjacent meadow and flooding from the ravine behind the Memorial. The meadow’s deep-rooted plants absorb water and direct runoff toward infiltration trenches forming a very large rain garden. A smaller rain garden next to the pond is filled by storm water from Phipps Run when it overflows the basin behind the Monument. Some of the rain water flows into a cistern which is used for filling the pond. These investments support regional efforts to reduce sewer overflows, flooding and erosion problems that are larger goals of restoring the Panther Hollow/Four Mile Run Watershed. 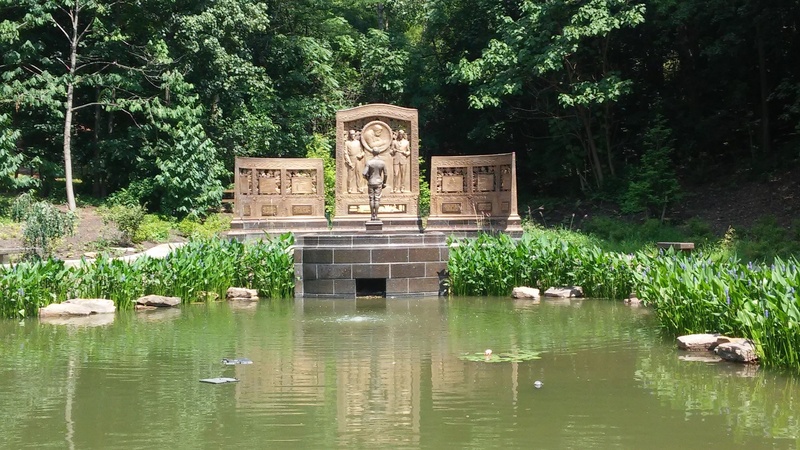 As designed by MTR Landscape Architects, the Lily Pond is now restored to its 1930 contours, graced with water lilies, and kept fresh with aeration. Flagstone walkways follow their original layout. The heart of the monument is now accessible thanks to a subtle ramp and the elimination of a step. The project also created a new walkway behind the Memorial for improved viewing of the beautiful reverse face of the Memorial sculpture, as well as a rustic path loop up toward the ravine and across the stream. The monument has been cleaned, repaired, polished, and sealed. Gold leaf highlights the carved locomotive and inscriptions. Energy-efficient lighting plays across the surface of the sculpture, and creates a halo of light in the tree canopy around the pond to enhance reflections. Lush plantings of canopy and ornamental trees, flowering shrubs, and perennials create a garden setting to reward frequent visits. The Pittsburgh Parks Conservancy has established a maintenance fund to ensure availability of resources for future needs.